Layers of cheesecake and homemade pie filling make this Cheesecake Apple Pie the best pie for fall parties. 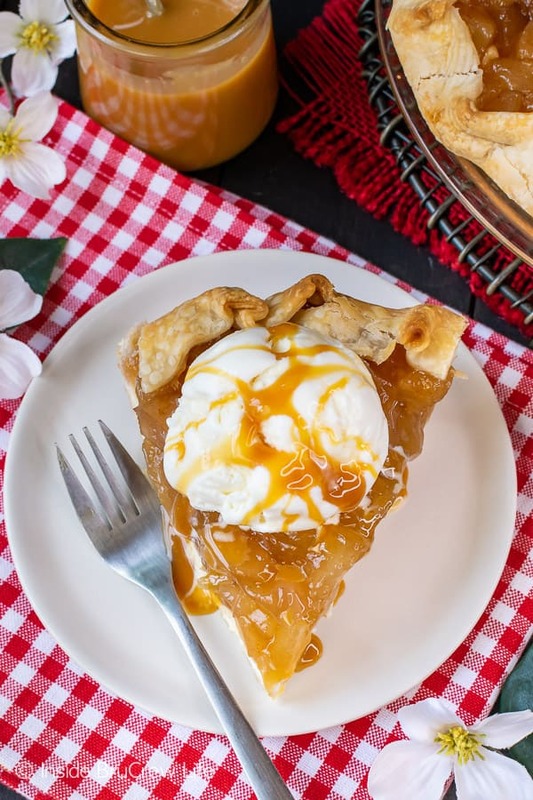 Enjoy a slice with ice cream and caramel. 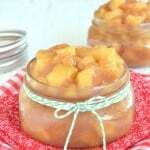 Did you see this Homemade Apple Pie Filling from the other day? I knew that I needed to make something else right away before I ate all the homemade pie filling with a spoon. Trust me. It’s that good. Just so you know, it is pretty awesome mixed with some Greek yogurt, or on top of this Vanilla Bean Cheesecake too. See? There are so many reasons why you need this apple pie filling in your life this fall. Since the jar of pie filling was in danger of being eaten by the spoonful, I had to find another way to use the pie filling this fall. Adding cheesecake to everything is one of my super powers. LOL! But seriously, I love finding ways to enjoy creamy cheesecake in every dessert. 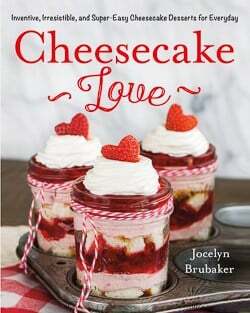 In fact, I love creating cheesecake so much that I wrote an entire cookbook about cheesecake. 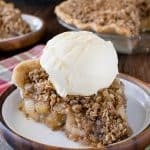 This Cheesecake Apple Pie is one of our absolute favorites, so I included a version of it in Cheesecake Love with the topping from this Apple Crisp Pie. Match made in heaven!!! 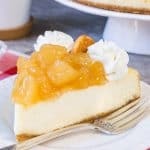 It’s truly the best apple pie cheesecake around!!! 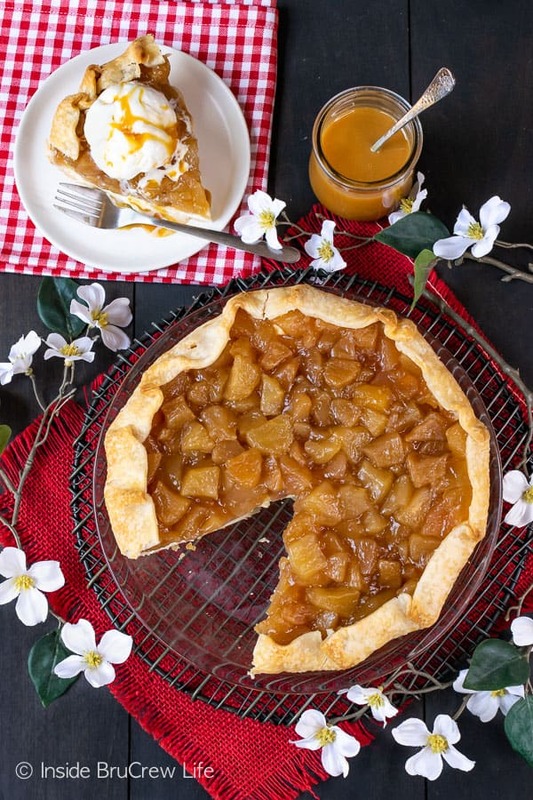 Why choose between cheesecake and apple pie when you can have both desserts combined in one pie crust! Beat your cream cheese and sugar until creamy. Add an egg and beat again. Unfold a pie crust into a 9 inch pie plate. Spread the cheesecake in the bottom of the pie crust. Spoon the pie filling on top of the cheesecake. Fold the pie crust over the pie filling pleating it as you go around. Bake the pie for about 40-45 minutes, or until the pie crust is browned. Remove and let it cool for an hour before refrigerating it. Refrigerate the Cheesecake Apple Pie for at least 4-6 hours or overnight. 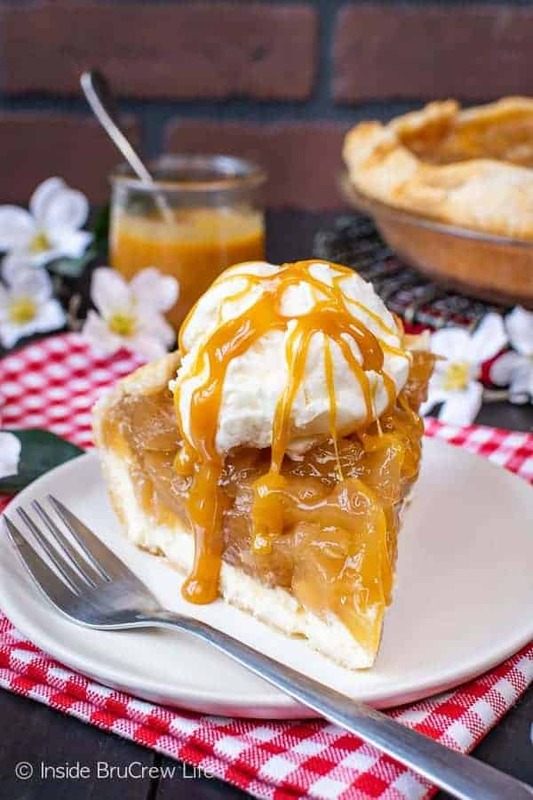 Serve slices of this awesome pie with a scoop of vanilla ice cream and drizzles of caramel topping. I prefer a salted caramel because it just makes it so much better! The layers of cheesecake and homemade pie filling make this Cheesecake Apple Pie a favorite dessert for fall parties. 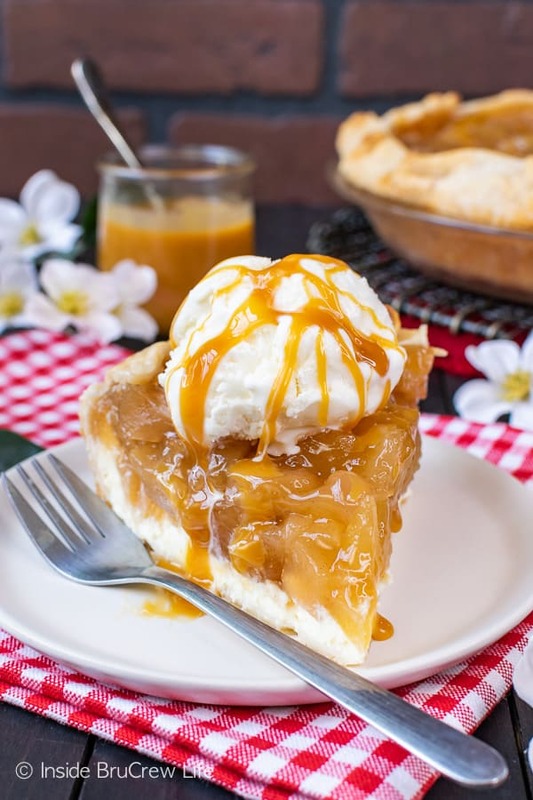 Enjoy a slice with ice cream and caramel. In a mixing bowl, beat the cream cheese and sugar until creamy. Add the egg and beat again. Roll out the pie crust according to the package directions. Place it in the bottom of a 9 inch pie plate and leave the extra dough over the edges. Spread the cheesecake in the bottom of the pie crust. Gently spoon the apple pie filling on top of the cheesecake. Fold the edges of the dough up and over the filling. Overlap the dough to create a large pleated look. Bake for 40-45 minutes. Cool on a wire rack for an hour then refrigerate until chilled completely. Serve with vanilla ice cream and caramel ice cream topping if desired. Keep refrigerated in a sealed container for 5-6 days. You can use canned pie filling if you don't have time to make your own. 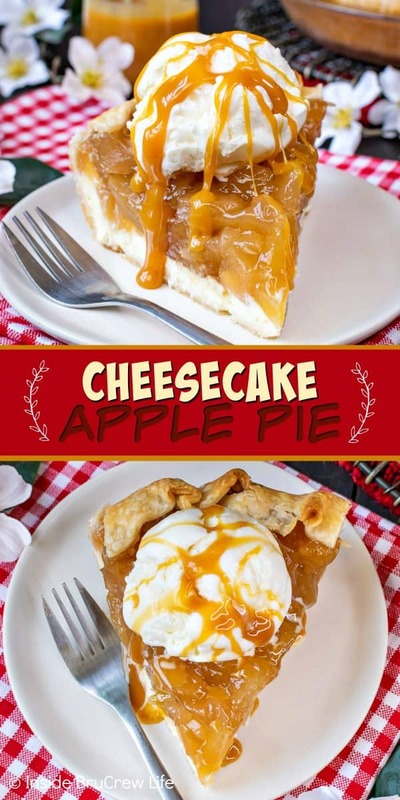 *The post and recipe for this Cheesecake Apple Pie was first published on June 5, 2013. 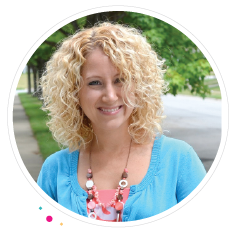 The pictures and post has been updated and republished on October 14, 2018. This is just not a good idea…two of my favorites combined into one delicious treat. That is just mean! Haha, you will love this for sure then!! This recipe is perfect for those hot summer days like the “4th of july” it”s as “american” as….well, you know. 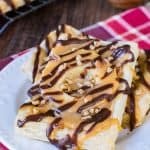 This is one of my favorite ways to eat pie! I have done it with apple & blueberry pies & it’s the best! My layer is a lot thinner, but it’s probably way better with more cheesecake in it! I love this!! I just made apple cheesecake bars for a friend and OMG they’re so good. See you soon Jocelyn! I can always count on you to take desserts to the next level Jocelyn! 😀 This looks amazing! We are totally on the same wave length. I poste an apple pie cake today! I am loving this cheesecake! Yum, apple pie cake sounds delicious!! Oh, so very, very tempting! I love cheesecake and I love pie! Um, wow!! How awesome does that look!! Seriously, I am drooling over here! Last fall I made an apple pie that this post reminded me of. And now, I want to make this. I grew up eating something at a local restaurant that looks similar to what yours looks like and it was a such a treat for me as a kid! Wow, I need your pie! 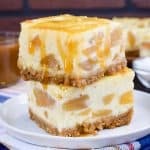 I love any dessert with apple, this would be such a hit at home. There is only one word for this: BRILLIANT! You’ve merged two desserts that are fabulous in their own right and just blew.my.mind. 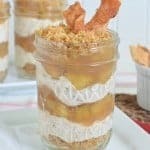 I want to throw a party just so I can make the peanut butter parfaits! They are so cute, and I’m sure taste fantastic! Sounds awesome! I love that you combined cheesecake and pie! This looks awesome! 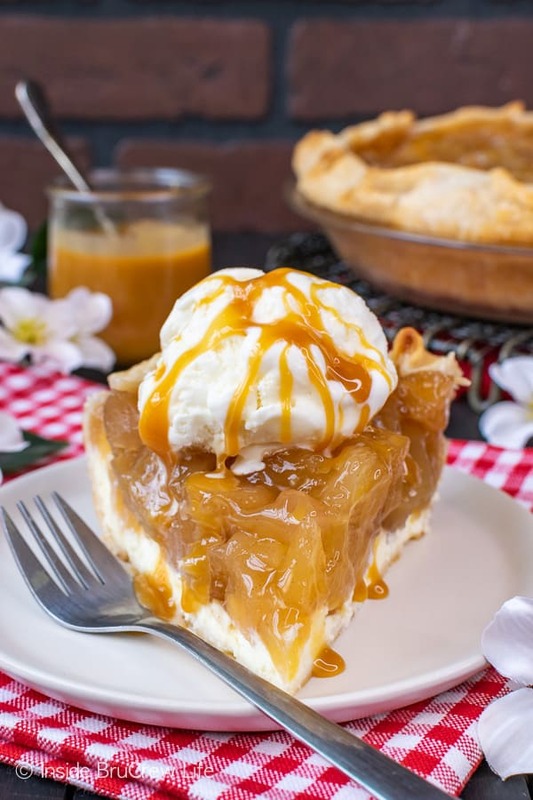 Apple pie is my favorite pie to make and I love that you put cheesecake in the pie too! Oh I’m all over that- looks amazing!!! Wow-that is over the top delicious looking! Now I know what I’ll be doing with that apple pie filling! You should make this into an ice cream next time! Yup, I’m going to need to make this apple pie filling ASAP! This pie is calling my name. Yum! Love this, seriously drooling over here! This looks delicious! You can NEVER go wrong with cheesecake and apple pie! You’re very welcome. I always make sure to give credit where credit is due.